How often do we hear and use the phrase ‘seeing is believing’? It is a saying which, according to the Cambridge English Dictionary online, means that “if you see something yourself, you will believe it to exist or be true, despite the fact that it is extremely unusual or unexpected”1. Being a pragmatist myself, there are numerous instances where I reserve judgment and believe something only when I physically see it. In other words, for me, like for many, ‘the proof is in the pudding’! So at Phonak we thought, why not extend this concept and create a tool which allows hearing care professionals to ‘hear for themselves’ in order to ‘believe it to be true’. Hence, the genesis of Hearing is Believing. Hearing is Believing – what, how, why? WHAT: Hearing is Believing is a blinded listening experience allowing listeners to hear the differences between sound recordings made through the latest premium level hearing devices from a range of manufacturers. Recordings are made of sound samples in various listening scenarios, e.g. Speech in Quiet, Speech in Noise, Speech in Loud Noise, as well as Media Streaming of Music and of Speech. Listeners rate each sample as “Good”, “Better” or “Best”, and submit their selections. Once submitted, they get to review their personal ratings online and compare these to the combined selections of all other participants. HOW: To ensure standardization when recordings are being made, the audiogram, fitting parameters (e.g. default first fit prescription for a new wearer), acoustic coupling (e.g. closed domes), sample sound files and ANSI standard ear canal, are kept identical for all devices included. It is only the volume which is equalized across recordings, to ensure no bias is introduced based on intensity. Our proprietary online software, Sonova Sound Survey, allows workflow customization of the various sound scenes and the applicable recordings made with each manufacturer’s devices to be uploaded. Careful instructions are added to guide the listener through the Hearing is Believing experience. 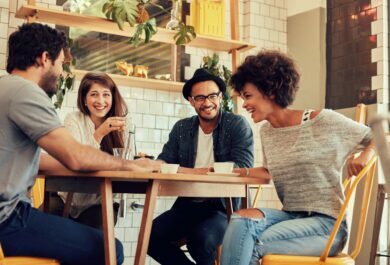 The order of sample playback is randomized each time Hearing is Believing is launched by a new participant and competitor technologies are kept anonymous – only Phonak is named in the results. WHY: Hearing aid manufacturers promote new technology features and the benefits of these in various ways: through publications describing scientific research data, marketing brochures, videos, testimonials, and of course via live demonstrations at industry events…. I love the live demos! 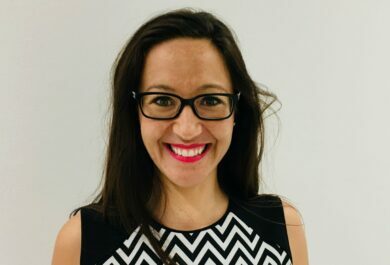 They provide a ‘touch-n-feel’ peek into how the boundaries of technology and signal processing have been pushed to help more hearing aid wearers hear better, in more environments. I am also impressed by how creative and elaborate these demos can be. None more than that recently showcased at the launch of Phonak Marvel at EUHA 2018 (European Union of Hearing Aid Acousticians) in Hannover last month. However, whilst these sound and technology demos are fantastic, they often present a unilateral perspective of feature sophistication and benefit, since they do not routinely provide the opportunity for the listener to directly compare sound quality across a range of manufacturers, side by side, in an easy and user-friendly way. Allowing participants to listen, select and review results in this blinded and anonymous way offers the listener an instant understanding of their own sound quality preferences, because as I mentioned before… Hearing is Believing! Whilst I am by no means promoting this as a highly scientific study, using this style of listening survey provides one method to collect empirical preference rating data based on an direct comparative listening task. The results from 323 participants experiencing Hearing is Believing at EUHA 2018 are… well… marvellous! Results showed 74% of participants rated an overall preference for Marvel over our strongest competitors in the market. It was especially pleasing to see that 83% of participants preferred the sound of Marvel for the Speech in Quiet scenario, supporting all the research and development put into enhancing the Adaptive Phonak Digital (APD) first fit pre-calculation3 for spontaneous acceptance – something we refer to as “Love at first sound”. It was also satisfying to see high ratings for the quality of streaming of music and speech, supporting my favourite advancement of all – that the enhanced operating system, AutoSense OSTM 3.0, now also automatically classifies streamed media inputs as speech or music, to ensure the most optimal settings are applied for the wearer, at all times4. An industry first! I am so proud to work with the clever folks who develop multifunctional technologies such as Marvel, which include eSolutions (Remote Support, myPhonak app, Phonak myCall-to-Text app, Phonak Hearing Diary, and more) enabling hearing care professionals to embrace eAudiology and extend their service offering, reaching more clients. Through these developments, the clients themselves are empowered to receive quality care at a time and place which are convenient for them. 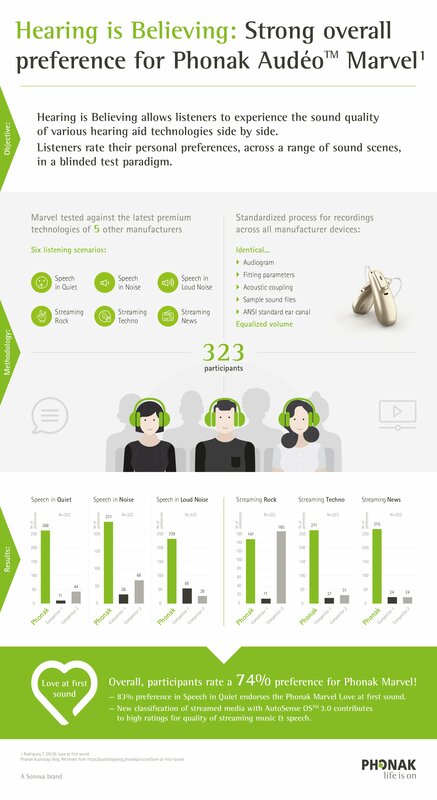 Marvel also includes binaural wireless signal processing with direct Bluetooth streaming and hands-free phone calls from all Bluetooth-enabled phones, made possible by the Phonak signature Binaural VoiceStream Technology2. Additional signal processing enrichments include the availability of dual path compression, increased vent loss gain compensation2, and the incorporation of even more sound scenes for Calm, Speech in Noise, and Loud Noise into the training of AutoSense OS 3.0 for added robustness of the system! A similar pattern of preference ratings is being seen in individual countries as Marvel is currently being rolled out across the globe. Of course, these ratings are from the hearing care professionals fitting the technology. Next, I look forward to learning the perspective of hearing aid wearers themselves, experiencing Marvel in the real world. 1 Definition of “seeing is believing” in the English Dictionary. Cambridge Academic Content Dictionary, Cambridge University Press. Retrieved from https://dictionary.cambridge.org/dictionary/english/seeing-is-believing, accessed on October 31, 2018. 2Liebe, S. and Rodrigues, T. (2018). Phonak AutoSense OSTM 3.0: The new & enhanced automatic operating system. Phonak Insight. Retrieved from www.phonakpro.com/evidence. 3 Janse, S. & Woodward, J. (2018). 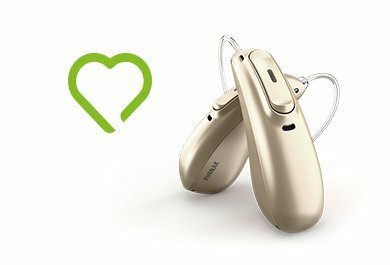 Love at first sound: the new Phonak precalculation. Phonak Insight. Retrieved from www.phonakpro.com/evidence. 4 Legarth, S.V., Latzel, M. & Rodrigues, T. (2018). Media streaming: The sound quality preferred by hearing aid users. Phonak Field Study News. Retrieved from www.phonakpro.com/evidence. At 70, and now retired, I have finally made the step to re-entering the world of sound and music. After an an initial fitting with the Audeo B90 Direct, which has been very successful, I have made the decision to upgrade to the Marvel RT. I spent my work career as a technologist, and now am wildly enthusiastic to embrace the technology and the humanity of hearing a full spectrum of life again. Thank you for this look at my next step.